SeaWorld's orca tanks haven't actually been people-free since trainers were ordered out of them. 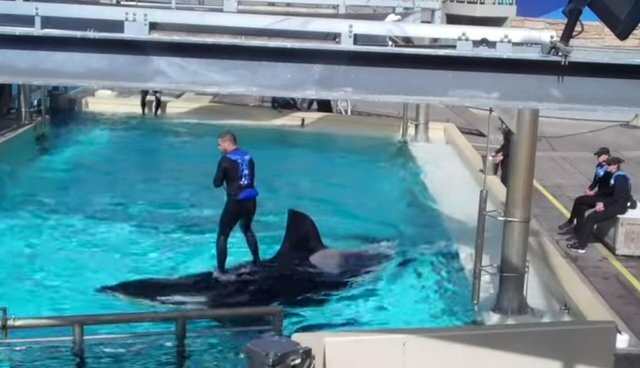 A video, uploaded last October but recently picked up by Cetacean News Network, shows one trainer riding around and surfing atop the back of a 12-year-old male orca whale at SeaWorld San Diego. Wearing a protective "emergency vest," the trainer even swims around with the whale in the pool. The whale in the video is the son of Tilikum, the orca who killed senior trainer Dawn Brancheau in 2010. After her death, the Occupational Safety and Health Administration (OSHA) ordered the company not to allow its trainers in the orca tanks. The company appealed this decision, but finally accepted the ruling last April. However, OSHA's mandate didn't cover "medical pools," the small isolation tanks that whales can be moved to for procedures. Dr. Naomi Rose, a marine mammal expert, told The Dodo last October that trainers routinely enter these pools, in fact, arguing that interaction with the whales "desensitizes" them to contact with humans, making them less likely to attack should a person fall into a pool. But Dr. Lori Marino, executive director of The Kimmela Center for Animal Advocacy, told The Dodo that this shouldn't be going on. "If it is too dangerous for trainers to get in the water with the orcas during shows, that should hold for other times as well," she said. There have been no recorded fatal attacks by wild orca whales on humans. But given the long list of incidents concerning captive orcas, getting in the pool with one of them might not be the best idea.